Spring is here, the sun is shining, and it’s set to be a long, hot summer… of Brexit. As the UK is granted yet another extension, the never-ending chaos continues. Despite offering to resign if MPs supported her deal, and asserting she wouldn’t allow an extension beyond June 30 (now fittingly extended to Halloween), Theresa May is, shockingly, still in charge. Not only has her deal been rejected three times, but the government has voted down every other possibility, including no Brexit, leaving parliament at an impasse. It’s fair to say absolutely everyone is bored of Brexit, but for new voters, this long slog is particularly tiresome. Unable to vote in 2016, they were forced to watch silently as their future was decided for them. In the days following the referendum, a report emerged that suggested the Remain vote would have won the majority had the voting age been lowered to 16-years-old. Brexit will undeniably have more of an effect on the younger generation, and given how vital 16- and 17-year-olds were in the Scottish independence referendum process, it’s baffling that middle aged MPs were able to block young people having a say. 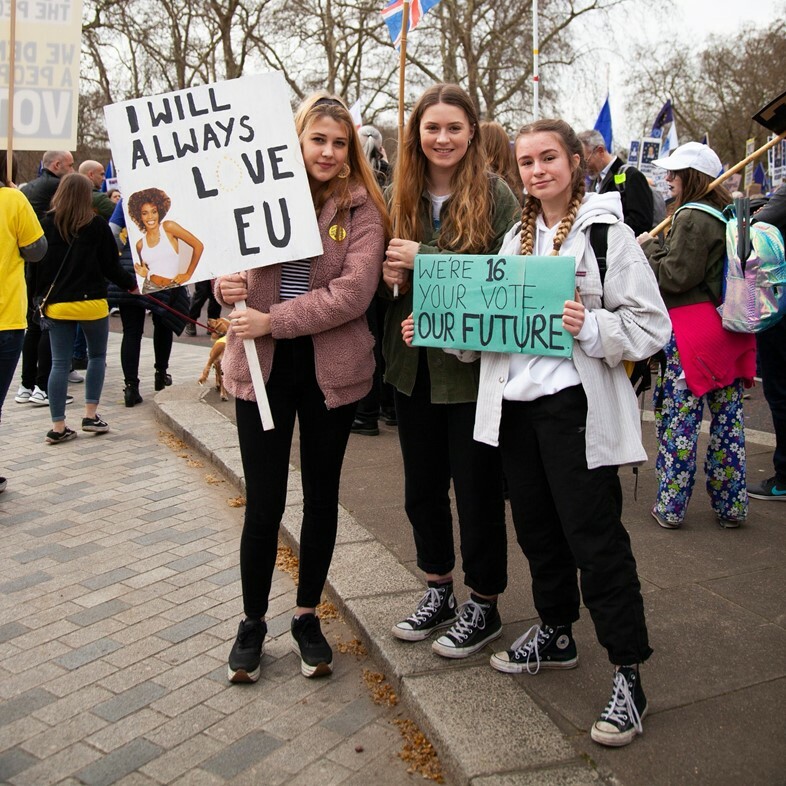 As the UK remains in the EU almost three years after the referendum – with no conclusive solution in sight – the 16- and 17-year-olds from 2016 have now passed voting age, making them eligible to vote in a potential second referendum. With 74 per cent of these young people backing Remain, the voting landscape could look very different if the decision was put back to the people. As today (April 12) marks the second date the UK was set to leave the EU, we speak to 10 people who have turned 18 since the 2016 referendum about what they want to happen now. “As a young person who was politically engaged, it was incredibly frustrating to be excluded from the democratic process (in 2016) when the result would affect my future so greatly. The decision to exclude 16- and 17-year-olds was largely based on the assumption that we did not know what we were voting for. The irony of this is clear due to the fact that not a single person permitted to vote knew they’d be voting for the hugely damaging and chaotic mess that Brexit has left us in. Those of us who were aged 16 and 17 during the referendum are now eligible to vote, and yet we still have to watch our future be debated while being denied any say at all. “Despite being of age to serve in the military, pay taxes, get married and have a child, I wasn’t allowed to have a say on my future in 2016. Ultimately I felt sad because I know I was silenced in protecting my future, and the future of my children and grandchildren. “I felt like my future was being decided without me, I felt absolutely powerless. Over 70 per cent of 18-24 year olds voted Remain, which demonstrates that the majority of my generation wants to stay in the EU. With issues like the cost of housing and the generational wealth gap affecting the prospects of young people, I definitely think those who were 16 at the time of the EU referendum should have had greater input and been taken more seriously. “I had to sit and watch a referendum that would define my future three months before my 18th birthday. Jacob Rees-Mogg said we won’t start to see the positive impacts of Brexit for 50 years – that would be my whole working life. And that’s an estimate from someone who supports Brexit; it’s actually mind blowing. “I was incredibly disappointed, but unsurprised that I wasn’t able to vote on my future in 2016. Denying 16- and 17-year olds the vote on Brexit was short-sighted, I’ve been able to vote for three years now and Brexit is still ongoing, I’ve never had a say. Brexit will impact my future in every way imaginable, I can’t think of a single area of life that won’t be affected. “Being a dual national with both British and German citizenship, the European Union has been incredibly important to me. Young people have grown up with the rights and privileges of having an EU passport, and that’s now being taken away. “I primarily felt an overwhelming sense of helplessness, rather than anger (during the referendum). The Brexit vote notably marked a realisation of my own political naivety – an awakening to the concept that politicians use the discontent of real, working people to advance their own political positions.